I believe KissBank represents a shift away from the ‘Me Me’ generation towards a kinder, more connected society. KissBank - a ground-breaking website that aims to make the world a kinder place - has been launched in London. 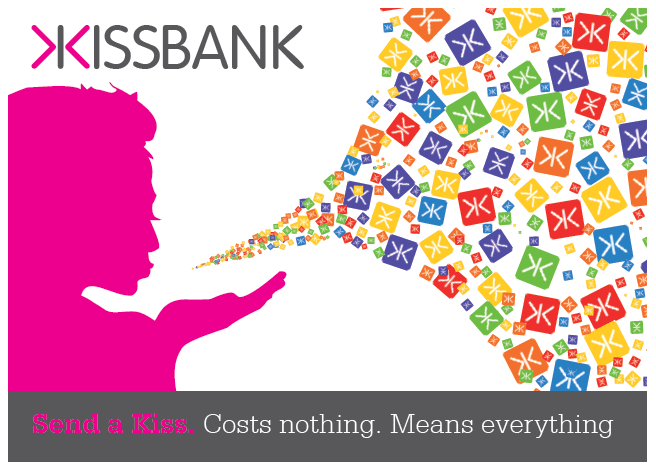 www.KissBank.com is the hub of a new global currency based on the ‘Kiss'. Every Kiss is free, carries a personal message and you send them to anyone you like. Every day millions of people around the world are helping others for little or no financial reward. Now they can be recognised and rewarded in www.KissBank.com 'kindness economy' because a Kiss in Chingford is the worth the same as a Kiss in China or Chile. Like any other bank, you track Kisses in and out of your personal account. The KissBank Index monitors who has received the most Kisses at every level - globally, nationally and locally. On New Year’s Day we publish the ‘KissBank Rich List’ - the top 200 in every country with the most ‘Hero’ Kisses. KissBank is also home to a global newsfeed of stories about amazing people who have done amazing deeds - stories that renew your faith in humanity. KissBank News features hundreds of celebrities who can be ‘Kissed’ for their tireless support of charities all over the world. Founder Bob Duffield says: “I believe KissBank represents a shift away from the ‘Me Me’ generation towards a kinder, more connected society." This press release was distributed by ResponseSource Press Release Wire on behalf of KissBank.com in the following categories: Children & Teenagers, Men's Interest, Entertainment & Arts, Leisure & Hobbies, Women's Interest & Beauty, Business & Finance, Education & Human Resources, Media & Marketing, Computing & Telecoms, for more information visit https://pressreleasewire.responsesource.com/about. KissBank.com: home of the 'Kiss'.